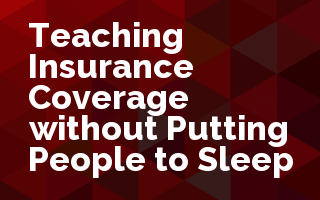 If you've ever tried to stay awake during a boring insurance coverage class, you're not alone. We've all done it. Join us as we bring together a panel of top insurance educators to discuss how they make coverage training more interesting and engaging. We have brought together four experienced trainers, educators, speakers and all around insurance geeks. Kevin Quinley, CPCU, AIC, ARM has instructed CPCU, AIC, and Insurance Institute of America courses for various CPCU chapters. He has also led many in-house training sessions on various aspects of handling claims with coverage issues. He serves as an expert witness and a claim consultant nationwide and has four decades of experience in claims and litigation management. He has written 700 published articles and 10 books on various aspects of claims, litigation, and risk management. Chris Behymer, CPCU, ASLI, CIW received his Bachelor of Business Administration degree from the University of Wisconsin-Madison, majoring in Risk Management and Insurance and Marketing in 1976. Since 1977, he has held a variety of underwriting, marketing, and training positions for both standard and excess and surplus lines insurance companies. He is currently the Director of Client Education for Markel Assurance in Scottsdale, Arizona. Chris has developed and lead classes for a variety of insurance industry groups including the Wholesale & Specialty Insurance Association (formerly AAMGA University), state Independent Agent Associations, a number of Surplus Lines Associations around the country and has served as Director of Education for the Arizona Chapter of CPCU. He is also an active member of SITE and has served on the Education Committee for AAMGA/WSIA University. Gregg Golson, CPCU, ACS, AIC, AIM, AINS, AIS, API, CSM is Vice President and Program Director at J.S. Held University at J.S. Held, LLC. He has 25 plus years experience in claims management and strategy, automation, consulting, mediation, training, data management and budgeting. Gregg has handled over 12,500 claims around the country including 31 different catastrophes and over 350 large losses in 13 states. He has been published in several leading insurance industry publications and speaks nationwide. Larry Nicholson, MBA, is the Director of Underwriting and Training for American Integrity Insurance, a Tampa, FL based property and casualty insurance carrier. He is responsible for the day to day operations of all underwriting and training functions for the company. He also serves on the Board of Directors of SITE as the Vice President of Marketing. Larry has working in the insurance and risk management industry for over 14 years. He hold a Bachelors degree in Business and Finance, a MBA degree and a MS degree in Risk Management and Insurance from Florida State University. He is also an active CPCU candidate. Larry is also in demand as a writer and speaker within the insurance industry.